Does the thought of atropine make you tachycardic? Dextrose dosing make you dizzy? 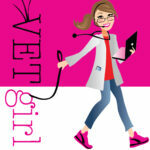 Join VETgirl for our Real-Life Rounds! Our 30-minute "cage-side rounds" are designed to teach you what you really need to know! We will review crash cart basics, essential items, and life saving doses. That way, when there is a cardiac arrest, you won't have to fake a diarrhea emergency and run out of the room during CPR! Can vet tech sign up? Our CE is approved for both veterinarians and veterinary technicians, but you have to be a VETgirl ELITE member ($199/year) to get our RACE-approved CE.